This article is gonna be a bit different from most of our other articles. We typically like to fit a ton of activities into a visit somewhere new. We like to make a point to really dig into an area and see everything the place has to offer. But our trip to Townsend, TN had a completely different focus. We needed to get away. The roughest time for us as teachers is the time from September Break (third week in September) to Thanksgiving Break. It is the longest stretch without time off and is always crammed with things to do… stuff we have to do both personally and professionally. Sunlight trying to break through the clouds in the Smokies. Several years ago, we decided to rent a cabin up in the mountains and just spend the weekend relaxing. We have made a tradition of doing the same in the past few years. 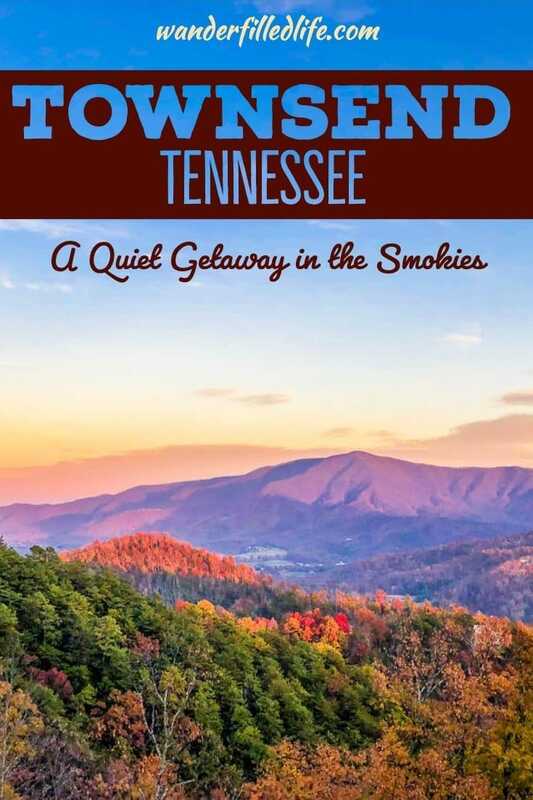 For this trip, we chose Townsend, TN for a Smoky Mountain getaway. 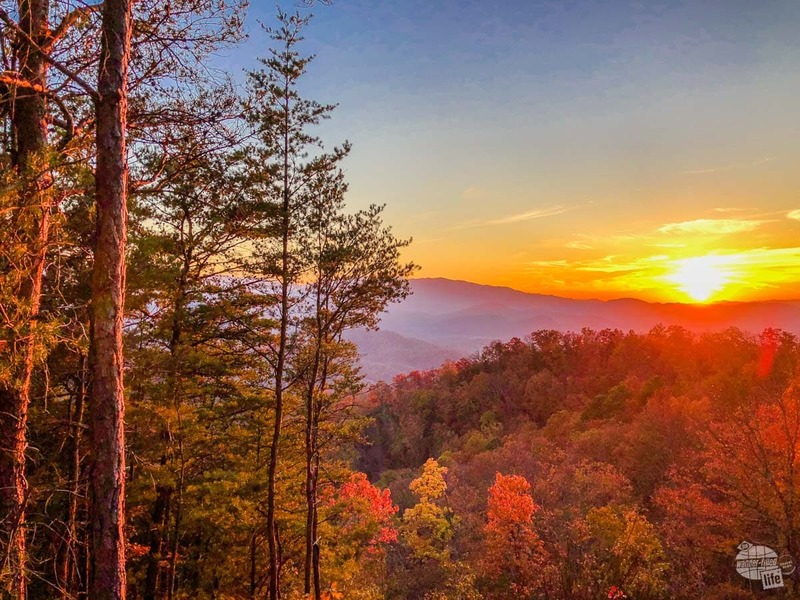 Townsend, TN is located in Eastern Tennessee, just outside Great Smoky Mountains National Park. Location-wise, this is a perfect spot for getting away from Knoxville. 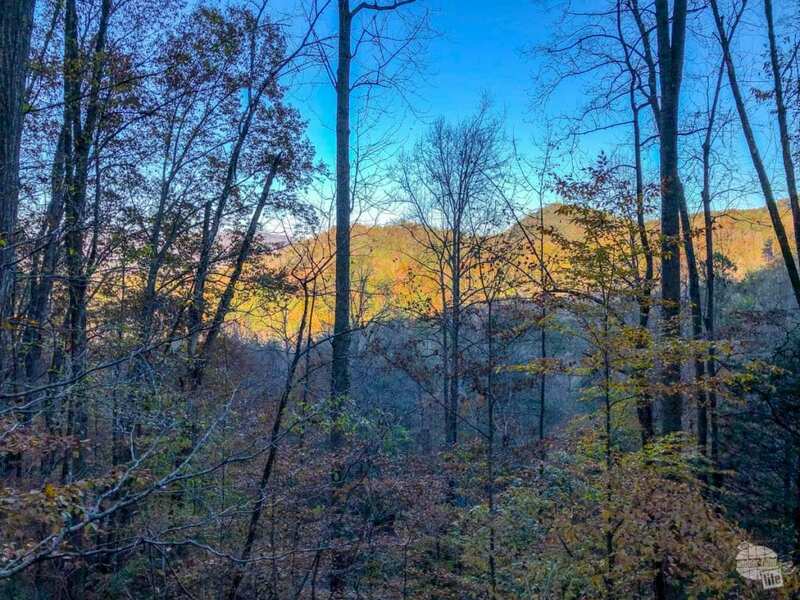 From Atlanta, it takes a bit more to get here than the towns in North Georgia, but it is no more difficult to get to than Gatlinburg. This area advertises itself as the “Peaceful Side of the Smokies” and the nickname is well-deserved. 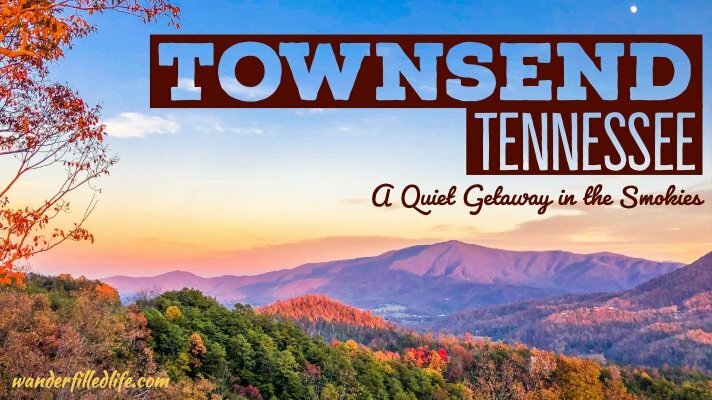 Compared to nearby Gatlinburg and Pigeon Forge, there’s not much to Townsend. Indeed, there’s not much to the town other than a few gas stations, a couple grocery stores and a handful of local tourist attractions. In short, it’s quiet, especially in the late Fall. We found most of the attractions, like Tuckaleechee Caverns and the Little River Railroad and Lumber Museum, had very limited hours if they were open at all. There are several tubing outfits and campgrounds along the Little River as you head into Great Smoky Mountains NP. The campgrounds appeared to be open, but tubing was closed in mid-November. So, there is a bit more to do in the summer, when the weather is warmer. Since we weren’t looking to do much, it was a perfect getaway for us. Our primary focus was on relaxation and there was plenty of that to be found in Townsend. We rented a perfect cabin off VRBO called the Bear View. 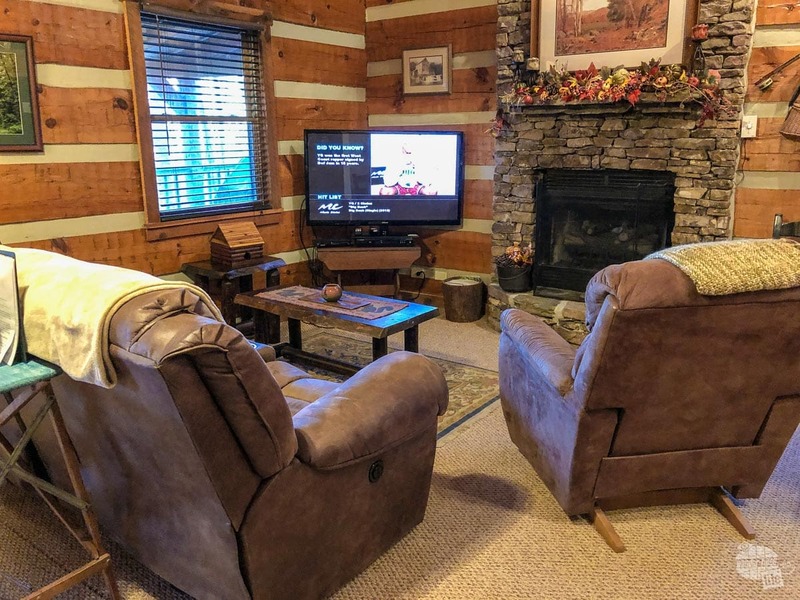 Located just minutes off the main road, this cabin provided the peace and quiet we needed. The living area of the cabin. A studio, the cabin had everything we were looking for in terms of amenities. The bed was comfortable, the couch had power reclining for both of us and the TV was great for watching football on Saturday (can’t miss college football!). The WiFi was OUTSTANDING (100 MB/s). Most importantly, the cabin has a comfortable hot tub under the covered porch. While we don’t mind an uncovered hot tub, a covered hot tub is better for enjoying in the rain. This is the view from the deck and hot tub of the mountains near Townsend. It did not get old. A nice propane grill rounded out the amenities, allowing me to spend some quality time cooking over a fire. 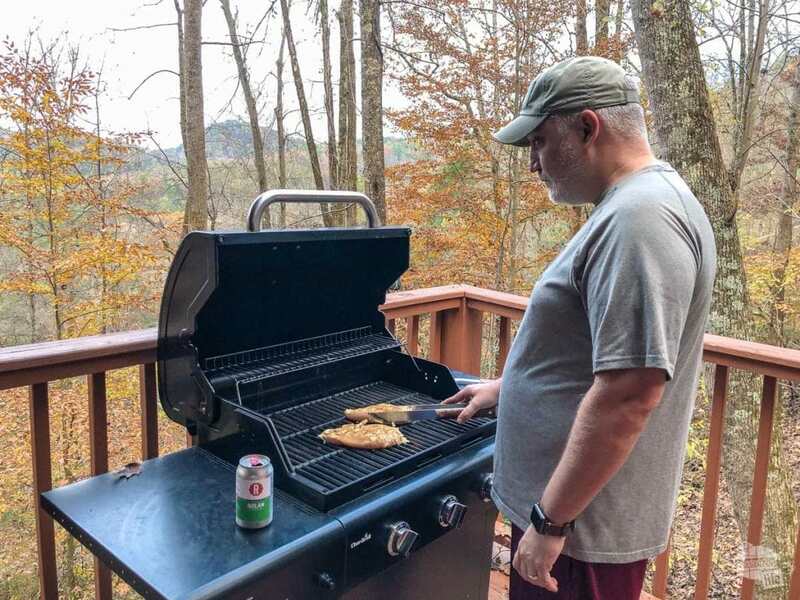 Living in a condo, I miss grilling. I typically only get to grill when we take the camper out. Bonnie also appreciates it when I take over cooking responsibilities. My only note about this cabin is the drive up. It is STEEP. I would be concerned about getting up and down in any kind of snow or ice. Otherwise, we found this to be a great spot to relax. Nothing like a tasty beer while grilling out at the cabin. There are several restaurants along the main drive through Townsend, so if cooking is not in your plans, there are options for a few days. After consulting Trip Advisor, we decided to try the Dancing Bear Appalachian Bistro and make it a date. We arrived a bit early for our reservation and were glad we did. The bar is extensive and we were happy to sit and enjoy a cocktail before dinner. 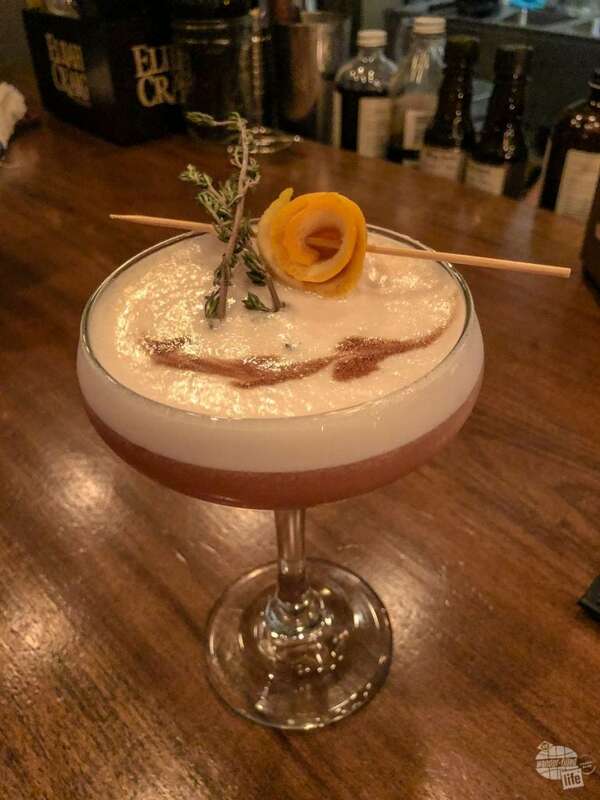 Father Thyme, one of the signature cocktails at the Dancing Bear. We started dinner with barbecue oysters and jalapeño cornbread. The cornbread, in particular, was amazing. 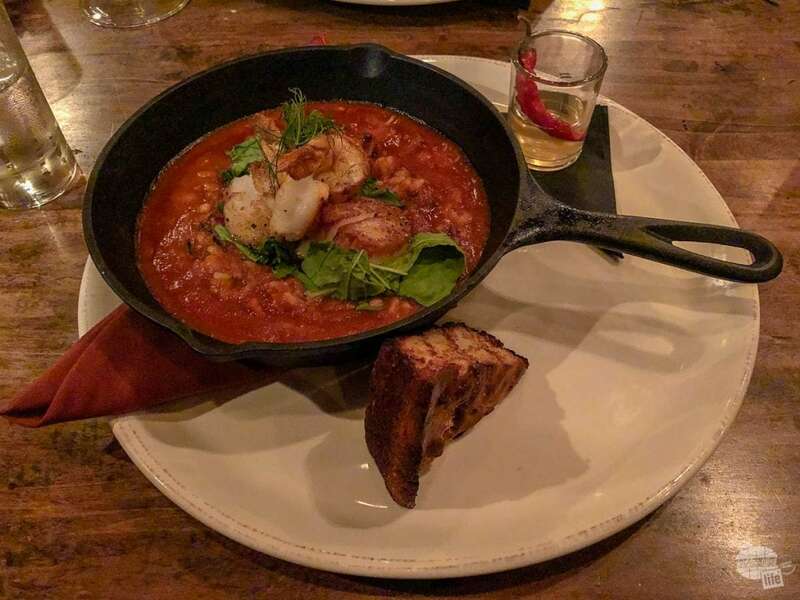 It had been cooked over a wood fire and had a delicious hint of smoke. Bonnie had the Blue Cheese Crusted Double Cut Pork Chop and I had the Appalachian Hot Pot, a seafood and sausage stew. Dessert was a Whiskey Apple Crumble. Everything was scrumptious. The best part, though, was looking at the clock after dinner and realizing how long we had been there. We had completely lost track of time and that felt great. 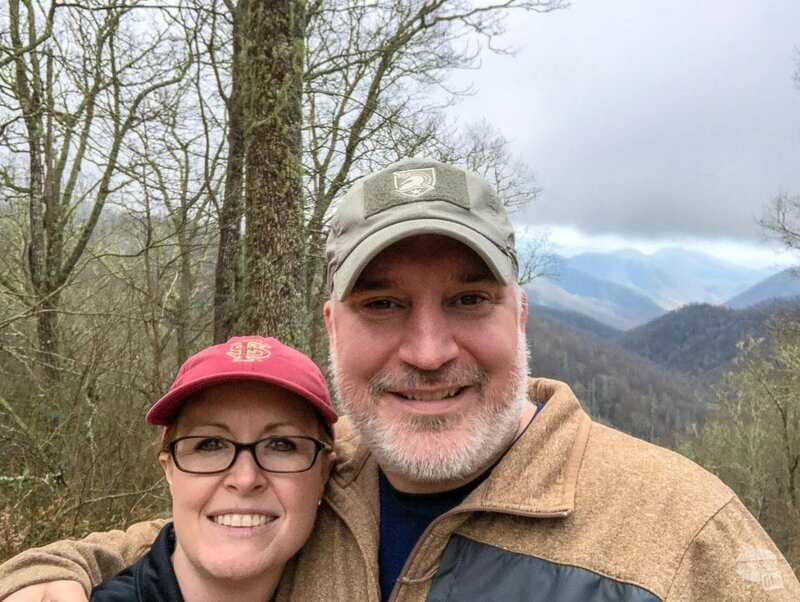 While we made a point to do a little as possible, we did get out and enjoy Great Smoky Mountains NP. I mean, c’mon, we can’t be that close to a national park and not spend some time seeing the sights. 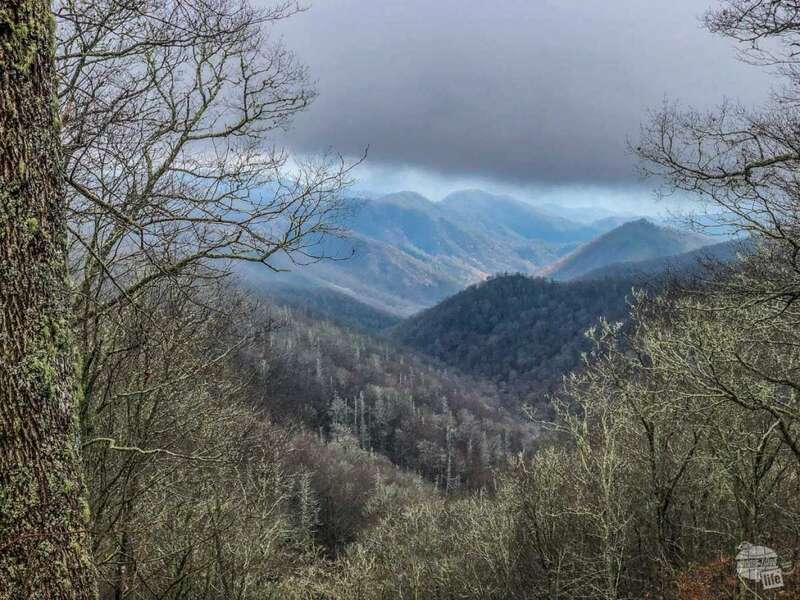 The Foothills Parkway, part of the park, is supposed to be a 72-mile scenic parkway stretching across the northern side of Great Smoky Mountains NP. 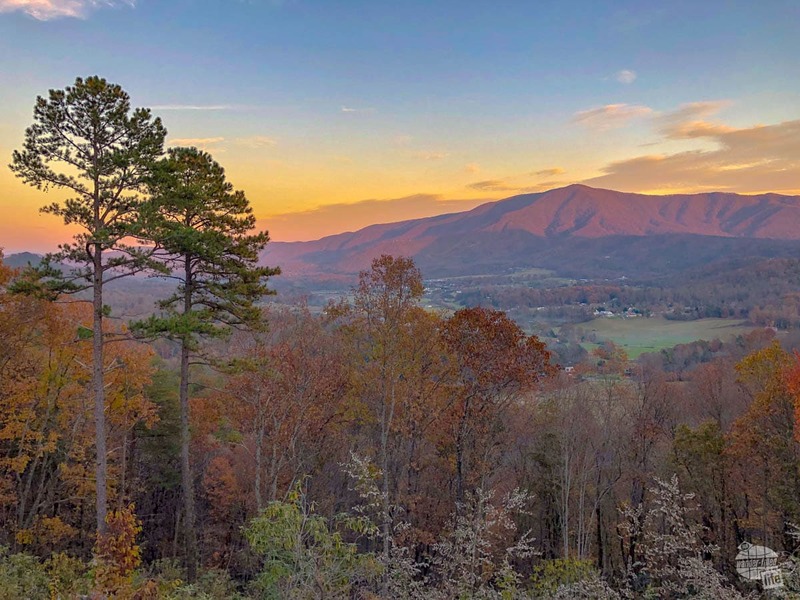 Sunset overlooking Wears Valley from a newly-opened section of the Foothills Parkway, part of Great Smoky Mountains National Park. Originally authorized by Congress in 1944, the road remains unfinished. That said, the Park Service JUST opened a section of the parkway (about a week before our visit), so now drivers can traverse the western-most 33 miles of the parkway. The new section was particularly difficult to bridge, but boy was it worth it. We drove the newly opened section from Wears Valley over to just west of Townsend. The views are tremendous. We went up for sunset before heading to dinner at the Dancing Bear. Go. Drive the road. You won’t be disappointed. Just remember that the sun sets a bit earlier because of the mountains. Just down the road from Townsend is the entrance to the park right by Cades Cove. When I say just down the road, I mean about 10-15 minutes driving to the park and another 20 minutes along Laurel Creek Road to get to the cove. 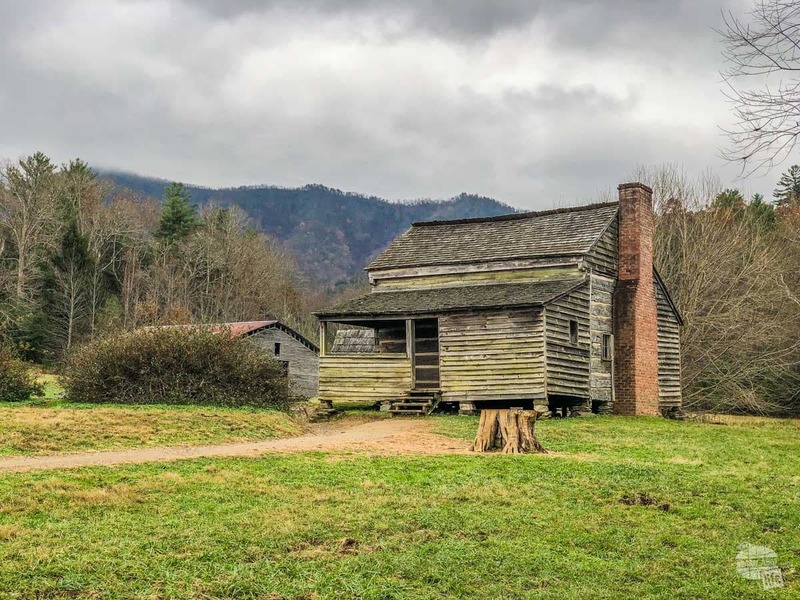 Cades Cove was an isolated mountain settlement from around 1818 on and you can easily see why. A broad valley protected by mountains on all sides, the park service protects several early homestead cabins, three churches and working grist mill. 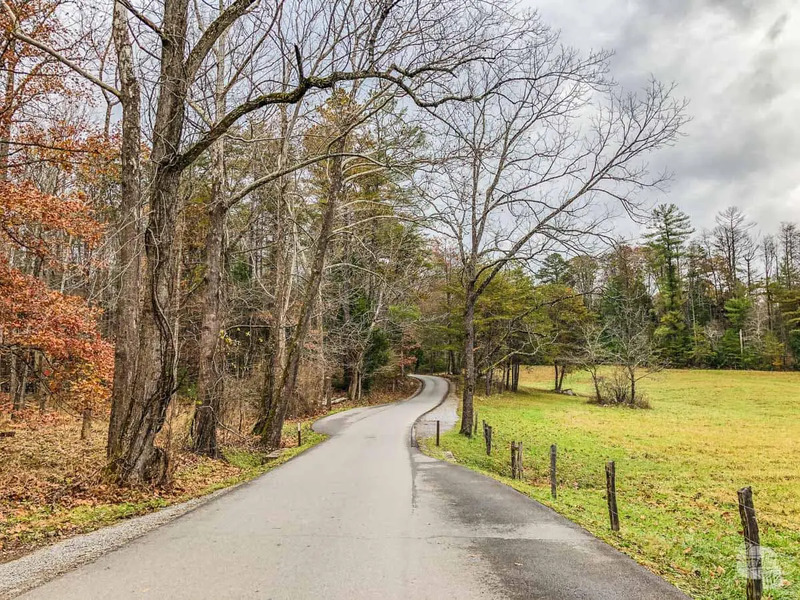 A drive through Cades Cove is like stepping back in time. The road is one lane, one way and moves slow. There’s plenty of wildlife and you will often find deer, turkeys and black bear frequenting the valley. There are also plenty of great hikes in the cove but just know the nearby mountain are steep. Back during our first trip to Great Smoky Mountains National Park in 2010, we hiked the Rich Mountain Loop. It was a great hike, but boy did the uphill kick our butts. For those with a capable vehicle, there is also the Rich Mountain Road, which is open most of the year. It is an unimproved road which heads back into Townsend. It had just closed before we got there otherwise you would be reading a lot more about it. There is a lot to love about Townsend. The town is quiet, doesn’t have all of the crowds and mess of Gatlinburg, but still provides easy access to Great Smoky Mountains National Park. We really enjoyed our time here. It was just a quiet, long weekend, but it recharged our bodies, our minds and our souls. We would certainly come back here to spend more time exploring the Foothills Parkway and Great Smoky Mountains National Park.